The Abel Armrest (Armauflage) is imported from Germany and Strings By Mail is proud to distribute this wonderful aid in the USA. 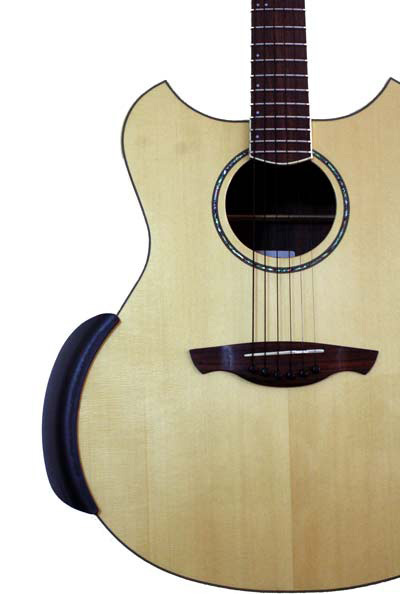 It is extremely comfortable and ergonomic for playing the guitar. Player beware... may make you play and practice longer! Read the customer reviews below, we have many happy players using this product. Installation is easy with the adjustment screw. 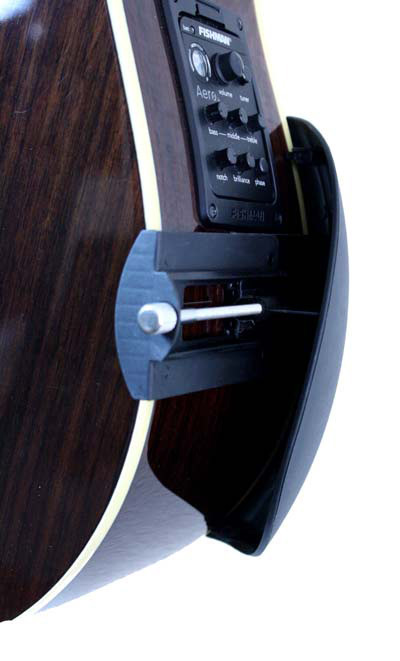 The rest has CORK mounting pads so you don't have to worry about damage or scratches to your guitar. It really changes the comfort level dramatically both for traditional classical positions and more relaxed acoustic positions. For travel, it can fit in most cases and gig bags. When playing, it practically hides itself under your arm and is not distracting at all to the viewer. The tone is not affected much at all as it attaches to the corners of the lower bout on the guitar. If fact, we believe it enhances the tone as your arm is not resting or damping the guitar top and sides. 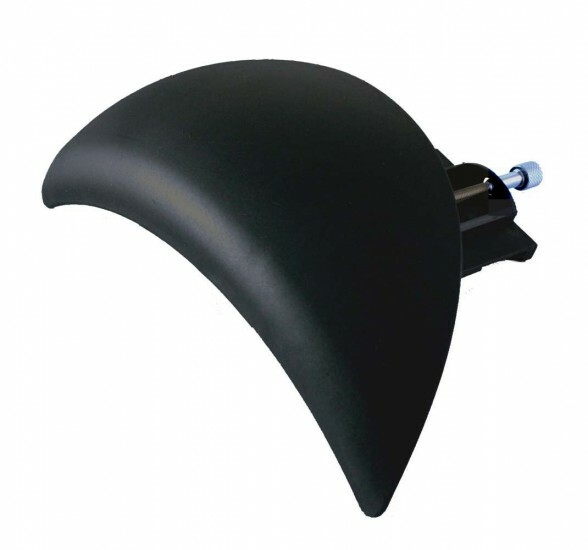 In addition, we have had a customer applaud the armrest as it elevates his arm enough that his nerve above in his shoulder does not get pinched, allowing him to play longer without any pain! Range of body thickness it will accept: 3.54 inches to 5.43 inches (89 to 137 mm). 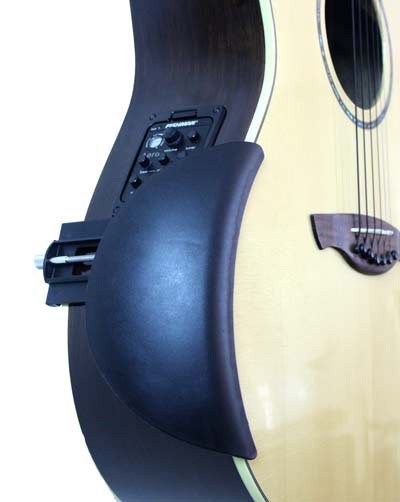 Although designed for right handed guitars, we have tested on left handed guitars and the Abel Armrest suits very nicely. 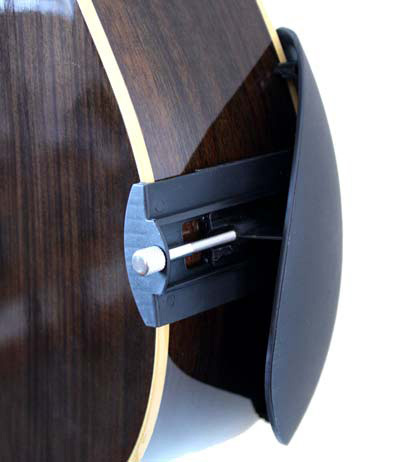 Note: It is recommended that guitar supports and other removable accessories that attach to the guitar be removed after each use, and only used on fully cured finishes at least six months old. If you are the type of player who finds changes to your instrument unsettling, this may take a bit of time to get used to as far as optimal placement. But once you do, it will feel weird going back to your guitar without it. It's apparent why some makers have put contours on guitar bodies for a while and with this device, you can add one to your favorite instrument without doing any carving. Not cheap but typical German craftsmanship and precision; this is not something hammered together in a garage. Looks like it will last a long time if taken care of. I was also surprised that it fit comfortably in my OM sized guitar case with room for the other items normally stored there. All in all, it's one of those add-ons like a capo that you could play your guitar without...but why? This is a nice addition to your kit. Andreas Abel’s classical guitar armrest much reminds me of the chin rests that are so much a part of the violin performance. 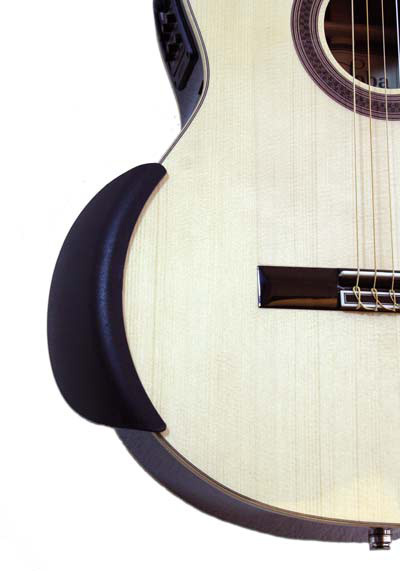 His armrest is an excellent tool for completely eliminating multiple age-old problems associated with classical guitar performance ONCE AND FOR ALL. First, the perfectly beveled and adjustable armrest provides for pain free and comfortable practicing and performing. By default, the armrest also provides not only for a louder volume, but also automatically allowing for all registers to resonate evenly and resulting in a much more vibrant and tighter base response, continuously. My only criticism of this wonderful armrest is regarding the quality of the felts, corks and the adhesive used for binding them. They should be made thicker and of much more durable material for cushioning purposes and the adhesive: it may not be strong enough and causes one of the rectangular felts to slide off. Otherwise, I highly recommend this armrest to all professional guitarists. Simple and effective. Just what the doctor ordered. The arm rest arrived right on time and is just what I wanted. Five stars! Easy to use and makes playing much more comfortable especially in hot weather. No more arm discomfort; allows me to play longer without needing a break. Q: My husband purchased one for me as a surprise.. and since i am smailler.. it raises my arm up too high when I am sitting down... can it be returned? or give us a call at 1-800-513-8271. Q: Why is it priced so expensive ? I can't really explain how the manufacturer sets their prices but this a very well designed and high quality armrest. The fact that it's produced in Germany and imported to the US probably also factors into the overall cost. Hope this helps. Q: I have a martin d-28 and the body width is 5 inches. Is there an adapter or longer screw attachment that would let this work for my instrument? Andreas Abel Armrest Long Screw, 3 7/16 in. Andreas Abel Armrest Long Screw, 3 7/16"
For larger bodied guitars. Can adjust from 3 1/4" to 5 1/16"